Traditionally, healthcare managers — whether they be health plans, care organizations, brokers or employers — have struggled to get their members to engage with their wellness programs and heath tools. Founded in 2009, Denver-based startup, WellTok, has been on a mission to help health plan providers boost engagement by providing a suite of Web and mobile social media-based solutions. Through a social health management platform, the startup is essentially looking to help health plans “consumerize” their services, leveraging the ease-of-use, accessibility and social and mobile functionality now inherent to so many consumer-facing products to improve the user experience of their health plans. Now contracted to serve nearly 10 million consumers through its social health platform, WellTok is looking to expand its footprint in a big way, and is today announcing that it has raised $18.7 million in Series B financing, led by Emergence Capital Partners and InterWest Partners, with contribution from existing investors, like New Enterprise Associates (NEA). The round brings the startup’s total funding to $26 million. Along with its new capital, the startup is also announcing that its executive chairman, Jeff Margolis, will be stepping into a new role as CEO of WellTok beginning today. Margolis had served as executive chairman for the past 18 months, and is perhaps best known as the founder and CEO of TriZetto, a healthcare IT company that helps healthcare organizations, health systems and physicians improve efficiency, care and simplify business processes. Margolis led the startup from founding through its IPO and $1.4 billion acquisition by Apax Partners. Margolis will be tasked with using the startup’s new infusion of capital to continue scaling and monetizing its health management platform, along with building out its social, community, personalization and gamification technologies. Since launching its flagship product, CafeWell, in 2011, the service has attracted “two of the country’s largest health plan organizations,” is now contracted to serve nearly 10 million consumers, and will look to add its tenth customer in the coming months. 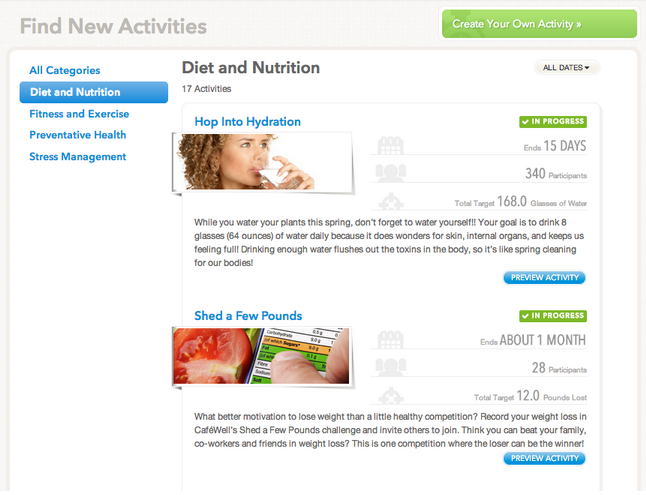 CafeWell uses personalization tools, fitness-tracking devices, wellness content, game mechanics and community dynamics to provide a more engaging health experience for end-users, which Margolis says has been able to produce engagement rates that are four-times what health providers see on their own websites. In addition, members average about 50 minutes/month on the site with a third participating in over 30 of the platform’s activities. While startups like Keas are busy building wellness platforms to help employers engage their employees and encourage healthy behavior, WellTok believes that it can provide a bigger value-add by engaging users directly through their health plans. The platform also aims to help health plans increase their standing among consumers (and its appeal) by providing flexibility, like allowing users to choose whether or not their activity and behavior is public, for example. On top of that, WellTok is taking a page from popular health-tracking devices like Fitbit, Up and Nike+ by allowing users to track health-related activity and earn points for meeting wellness goals. WellTok then allows members to convert those points into financial rewards or discounts on premiums. Health insurance has a shoddy track record when it comes to customer service — something that’s no secret to consumers or healthcare managers and healthplans. So any service that helps these healthcare organizations improve their usability is a welcome step in the right direction.